Last week The Spectrum, along with other college newspapers, received a letter from the Loyal White Knights of the Klu Klux Klan. The Spectrum regularly accepts and publishes letters to the editor and serves as an open forum for student discussion at North Dakota State. However, I refuse to give a platform to an organization rooted in hate and discrimination. For this reason I will not publish the letter from the KKK on the grounds of policy and ethical standards. The letter was received at other North Dakota colleges and attempts to build a following to ban the book “The Slave Players” by Megan Allen. Along with that, the letter also explains the KKK is wrongly under fire for being a hate group. The letter has no signature or name of an author claiming these strong words. 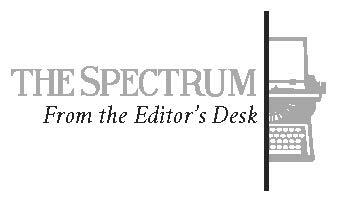 The Spectrum’s letter to the editor policy printed in every issue of the newspaper states that a letter must include the writer’s name. The writer of the letter refrained from including their name. By standards of policy, the letter is void and will not be printed. Although the letter does not conform to Spectrum policy, I believe it also violates moral and ethical principles regarding the freedom of speech. The letter in question begins by addressing that the KKK is not a hate group. “We follow the teachings of the Bible and only wish to keep the white race pure as God intended for His chosen people. Only those who live in ignorance call us a hateful,” the anonymous writer details. The Klu Klux Klan’s fundamental beliefs oppose people of color. The letter is inherently hateful and discriminatory towards that demographic given The Spectrum’s and SPJ’s policy. Under the First Amendment, all individuals are guaranteed freedom of speech and of the press, but when that speech crosses the line into hate speech and conduct and endangers the wellbeing of others is when the freedom of speech becomes misguided and misused. An organization such as the Klu Klux Klan has no place on our campus or in our newspaper. The freedom of speech only extends so far as to not inhibit other people’s rights and not cause harm. The speech in the letter is designed to incite violence and discrimination, it is at this point where speech is no longer legally protected and falls into the domain of conduct. Universities are intended to be inclusive environments where anyone can pursue their academic interests free of discrimination. Any party that tries to contradict that right does not have a place in this newspaper. The Spectrum stands with all students, regardless of race, and serves to be a platform for their voices.